NAA's Mission is: "To provide meaningful service and support for the persons we serve." 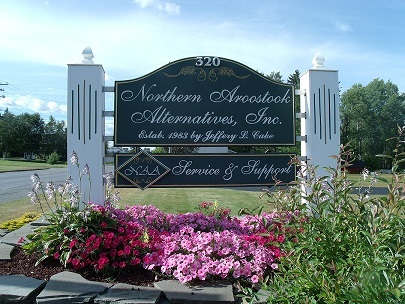 Welcome to Northern Aroostook Alternatives! We are a highly respected non-profit organization providing facility based community support for adults with various developmental disabilities and autism. Established in 1983, our agency has grown to serve up to fifty individuals in Northern Maine. Our commitment to quality service, provided by our compassionate and caring professional staff, has afforded us a well-earned reputation in our field. We have been recognized by the Senate and House of Representative of the State of Maine for our excellence and commitment to our clientele. Our community support facilities are located in Van Buren, Maine and provide two distinct levels of support. The Practical Life Program is located at 267 Main Street and Fundamental Life Program is located at 320 Main Street. You can find directions to each of these locations by clicking on the Directions link in the menu above.